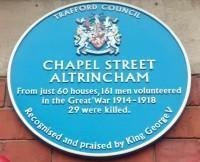 Family History Society of Cheshire - Norine Loftus "The Bravest Little Street"
Norine Loftus "The Bravest Little Street"
Chapel Street was a modest street in Altrincham of not more than sixty-one houses. At least 158 men enlisted and fought in the First World War. A roll of honour was erected in Chapel Street to recognise their bravery and George V had sent a telegram of commemoration. The roll of honour, listing all the men who went to war, was used as a starting point from which to research the biographies of the men. The book tells the individual stories of the men who enlisted and chronicles the history of Chapel Street from its early days in the 1790s to the 1950s when the last houses were demolished.